With the beginning of Winter season, different types of seasonal vegetables have started arriving in local markets of the capital. But the prices are skyrocketing. In fact, the retail market price is barring people from consuming the seasonal vegetables than the wholesale prices. Investigations in different markets in the capital found that prices of different vegetable range from Tk 50 – 80 per KG. Prices of some newer vegetables are more than average. The wholesalers in city’s Kawran Bazar informed that the prices will be controlled within next few weeks. They also opined that the prices are up because the vegetables just reached the market. Some seasonal herbs are also available in the market with a higher price while the older ones are being sold at a reduced price. 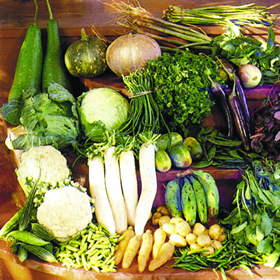 Seasonal vegetables like spinach, radish, tomato, eggplants etc. are a bit higher in price. Tomato is being sold at 140 per KG while news eggplants are TK 80 -90 per KG. Seasonal potato is in the top position with a price of around TK 120. Onion, garlic and green chili prices are unchanged. There is no hike in the prices of edible oils and spices. Many of the consumers are of the view that they are having trouble to get the seasonal vegetables. So, they try to get some from wholesale markets. On the other side, the sellers got back their smile as they have a remarkable profit.